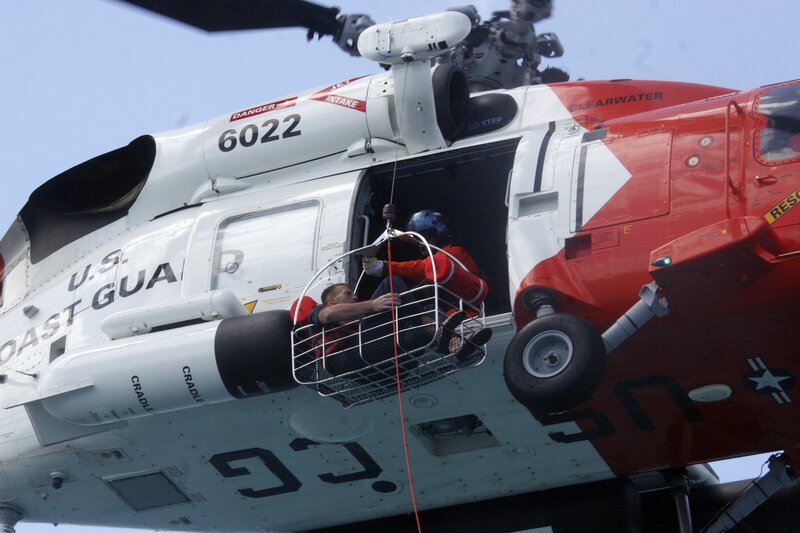 The Coast Guard on Monday narrowed the search area for two NFL players and a third man missing since a weekend fishing trip off the Florida Gulf Coast after crews rescued a fourth man clinging to their capsized boat. Survivor Nick Schuyler, a former University of South Florida player, told rescuers that the boat the four friends were aboard was anchored when it flipped Saturday evening in rough seas, said Coast Guard Capt. Timothy M. Close. Since then, Schuyler, who was wearing a life vest, had been hanging onto the boat found by a Coast Guard cutter 35 miles off Clearwater. Schuyler said the other three men got separated from the boat. The 21-footer belongs to Oakland Raiders linebacker Marquis Cooper, who, along with free-agent defensive lineman Corey Smith and former South Florida player William Bleakley, remained missing. •Pro Bowl may return to Hawaii: The state tourism board will reconsider the NFL’s offer to return the Pro Bowl to Hawaii in 2011 and ’12, a bid that was voted down last week. This time, the Hawaii Tourism Authority will probably approve the $4 million per year offer, which previously fell one vote short, said board chairman Kelvin Bloom. It was the second time the board turned down the NFL’s proposal. The Pro Bowl will be in Miami in 2010. •Redskins release Taylor: Washington has released Jason Taylor, one year after signing the former defensive player of the year. He declined the Redskins’ request to add a clause to his contract requiring him to participate in 25 of 39 days in the team’s off-season workout program. •Patriots add Baker: The New England Patriots signed tight end Chris Baker, who played seven seasons with the New York Jets. LeBron James scored 42 points, Mo Williams got 17 of his 30 in the fourth quarter, and the Cleveland Cavaliers rallied from an 11-point deficit in the final minutes to beat the Heat 107-100 in Miami. Dwyane Wade had 41 points, nine assists and seven rebounds for the Heat. •Thunder shock Mavericks: Nenad Krstic scored a season-high 23 points, rookie Russell Westbrook added 17 as part of his first career triple double, and the Thunder beat the Dallas Mavericks 96-87 in Oklahoma City, playing without their two leading scorers. Kevin Durant (sprained ankle) and Jeff Green (back spasms) were missing from the Thunder lineup. Westbrook had the franchise’s first triple-double since an off-season move from Seattle, adding 10 rebounds and 10 assists. •Denver suspends Anthony: The Nuggets have suspended Carmelo Anthony for one game for an “in-game transgression” Sunday against Indiana. It was not made public what Anthony did to earn the suspension. Emergency call-up Jesse Joensuu scored his first NHL goal in his first game and the New York Islanders earned a victory over the Colorado Avalanche 4-2 in Uniondale, N.Y. The Islanders got offense from another unexpected source as defenseman Bruno Gervais scored for the first time in 161 games – dating to April 18, 2006. Scottie Reynolds scored 23 points, Dante Cunningham added 18 and eight rebounds and No. 11 Villanova turned the ball over a season-low five times to beat Notre Dame 77-60 in South Bend, Ind. The Wildcats (24-6, 12-5 Big East) held the Irish (16-13, 7-10) to 36 percent shooting and forced 15 turnovers by Notre Dame. •Boise State cruises into third: Boise State took the upper hand on third place in the Western Athletic Conference with a 104-92 victory over New Mexico State in Las Cruces, N.M.
Boise State (18-10, 8-6) swept the Aggies (15-14, 8-7) and leapfrogged them into third a week before the WAC tournament in Reno, Nev.
•Griz, Cats to meet again: The Montana Grizzlies and Montana State Bobcats will meet for the third time this season in a Big Sky men’s tournament quarterfinal game at 7 p.m. Saturday in Missoula. The Bobcats end the regular season today against league champion Weber State. •UConn finishes undefeated: Renee Montgomery scored 23 points and the top-ranked Connecticut women beat Rutgers 69-59 in Piscataway, N.J., to finish off the fifth undefeated regular season in program history. The Huskies (30-0, 16-0 Big East) last went unbeaten in the regular season in 2002-03. Kia Vaughn scored a season-high 24 points for Rutgers (18-11, 9-7). An agreement that would allow David Beckham to finish the season with AC Milan before reporting to the Los Angeles Galaxy is close to being finalized, according to a newspaper report. The deal would call for Beckham to miss the first 17 games of the MLS season before he rejoined the Galaxy in mid-July, the Los Angeles Times reported on its Web site. Beckham had been due to report to Los Angeles on March 9. •Sounders sell out: The Seattle Sounders FC says single-game tickets for the Major League Soccer team’s inaugural home opener on March 19 have sold out. The Sounders will play the New York Red Bulls at Qwest Field. The perjury trial of Barry Bonds has been delayed at least through July and likely beyond, as an appeal filed by prosecutors over key evidence for the trial winds through the legal system. Federal court officials in San Francisco set a schedule for prosecutors and Bonds’ lawyers to submit legal written arguments to the 9th U.S. Circuit Court of Appeals debating the admissibility of three positive drug tests, so-called doping calendars and other evidence allegedly linking Bonds to steroids use. •Serena beats Venus: Serena Williams wore down sister Venus to win the Billie Jean King Cup in New York, finishing off the return of women’s tennis to Madison Square Garden with a 6-4, 6-3 victory.